Sir George Dyson (1883-1964) might be said to epitomise the self-made man. He died a Knight of the realm and a respected former Director of his alma mater, the Royal College of Music yet his origins were decidedly humble. He was born into an artisan family – his father was a foreman blacksmith in an engineering works and his mother was a weaver in a textile mill. Nor was he born into scenic surroundings: he hailed from Halifax, then a grimy industrial town, west of Leeds and Bradford in what was at that time the West Riding of Yorkshire. He was educated at local schools but got his big ‘break’ in life with the award of a scholarship to the RCM in 1900, just before his seventeenth birthday. I confess that sometimes when I’m reading biographies I tend to skim through the chapters that deal with the subject’s childhood, impatient to get to the “meat” of the life that is to be described. On this occasion, however, I read this section in detail. That’s partly because Paul Spicer writes so well and because he provides sufficient detail without writing reams. The main reason for my interest is that I was born and bred in Halifax, though the town in which I grew up in the 1950s and 1960s had changed a lot – for the better – from Dyson’s day, not least through the provisions of the Clean Air Acts. However, mention in Spicer’s narrative of many familiar street names and buildings was very evocative. In writing this biographical study Paul Spicer faced something of a problem in that Dyson was a private and unsentimental man who kept neither a diary nor any personal papers or letters. Fortunately, Spicer has been able to access Dyson material in many archives and he has benefited from detailed recollections and other assistance from Dyson’s daughter, Alice, who died in 2013, and his son, Freeman, who pursued a distinguished scientific career in the USA. On leaving the armed services in 1920 Dyson went back to teaching in public schools. His two children, Alice and Freeman were born and it seems that Dyson was very contented in his life and also in his marriage to Mildred Dyson. Spicer makes a very interesting point about the music that Dyson wrote during these years, contrasting it with the often-anguished music produced in the aftermath of the Great War by composers such as Vaughan Williams and Bridge. These and others, says Spicer, were “producing music which touched the soul through its introspection and pathos. Dyson was writing as if he had not a care in the world which, in many ways he hadn’t.” Yet Dyson hadn’t had an easy war; but he had been able to pick up the threads of his life more easily than some, it seems, after his war-time service was done. Furthermore, he was, throughout his life, a well-grounded, pragmatic man whose “way of celebrating was to drink a cup of hot chocolate. He was a home man, and whenever possible would always return home to his wife after a day spent elsewhere.” This is worth dwelling on, not because it suggests that Dyson was a dull dog - Spicer makes clear that he wasn’t – but because it indicates that Dyson’s feet remained firmly planted on the ground throughout his life. In 1924 he was head-hunted to become Master of Music at one of England’s premier public schools, Winchester College where the musical tradition was already strong. This began a connection with the city of Winchester that was to last the rest of Dyson’s life. He stayed at Winchester College until 1937. He greatly expanded musical participation in the school – a good example of his life-long wish for people of all levels of musical accomplishment to become involved. He also inherited the Nightjars Madrigal Society, a ‘Town & Gown’ body. Renaming it the Winchester Music Club, Dyson expanded it into a full choral society with an orchestral section. This society inspired him to take up serious composition again and he wrote both In Honour of the City and The Canterbury Pilgrims for it. The pinnacle of Dyson’s public service in music was his spell as Director of the Royal College of Music, which began in January 1938. To this post, as Spicer comments, Dyson brought “his vision and his determination to modernise”. He was also a very practical, hands-on Director, often involving himself in the minutiae of college life. As Spicer points out, the College when he arrived was rather cosy and amateur in nature and Dyson’s work to professionalise it, often in the face of financial stringency, was not universally appreciated. Most of the changes that Dyson made – and quickly – seem now, with the benefit of seven decades hindsight and as explained by Spicer, utterly sensible and very much geared toward improving what we would call nowadays the “student experience”. The changes concerned not only matters related to the curriculum or fabric of the college; other things received his attention. For example, previous Directors had been asked repeatedly, but unsuccessfully, to sanction the foundation of a college sports club. Not only did Dyson agree to the formation of a club; he became its President. Dyson’s determined leadership was a major factor in the RCM continuing to operate in London throughout the Second World War. In October 1939 Herbert Howells described the decision to carry on thus: “I think Dr. Dyson has shewn a very real courage – some have called it sheer stubbornness.” Dyson recognised that the exigencies of war might place limitations on the college’s work but he was determined that insofar as it was possible cultural life should continue – for the benefit of the public as well as musicians and artists. This was not the stance of a blinkered man, living and working in a bubble; rather it was the strong conviction of a man who had seen front-line service in the Great War. In this connection it’s moving to read Dyson’s Director’s address to the students at the start of term in September 1939. Spicer says of it: “This penetrating analysis and ‘call to arms’ shows Dyson’s deep sense of history, place, duty, leadership, and unswerving rightness of mind.” Spicer uses Dyson’s start-of-term addresses to the College as the framework on which to hang his narrative of his time as Director; this is a perceptive approach which provides many useful insights into Dyson’s approach to the Directorship, to music and to life in general. Not everything that Dyson did at the College was good, however. Spicer records that a considerable amount of the College’s important collection of old music books, instruments and artefacts was destroyed or dispersed during Dyson’s tenure. To be fair, though, money raised from sales of such assets was ploughed back into the College for the benefit of students: there was pragmatism behind the ‘cull’. Dyson’s devotion to ‘business as usual’ during the war years led to him sleeping at the college during the Blitz, despite the dangers, and taking his turn as a night-time firewatcher. The College suffered a direct hit by an incendiary bomb one night in February 1941 and Dyson was personally involved in the dangerous work of extinguishing the flames and limiting the damage. The College was hit again in February 1944. At the end of 1952 Dyson retired from the RCM Directorship and he and his wife moved back to Winchester. However, he continued many of his public appointments, which entailed frequent trips up to London for meetings. In passing, it’s interesting to note that when Dyson became associated with a musical organisation, such as the Royal College of Organists, more often than not he was invited to become President and never did he take on such a role as a mere figurehead. In retirement he also continued to compose and he did so energetically; indeed, Spicer quotes the late Christopher Palmer’s observation that “Old age rejuvenated him”. It was only in the last three or four years of his life that old age really started to catch up with him, including an increasing deafness, a particular scourge for a musician. Dyson died at home in Winchester in September 1964. His own music is conservative in style and he was not attracted to the advanced music of the likes of Schoenberg. However, his was by no means an unreasoned dismissal. On the contrary, in the years immediately following World War I he made a careful study of what he termed ‘the more extreme revolutions in contemporary music’ and these studies led him to produce a significant book, The New Music, in 1923-24. As Spicer puts it, this book and various lectures and talks confirm that Dyson “understands the music of Schoenberg intellectually and can analyse it in depth. But his ultimate conclusion is that this new experiment in music is a cul-de-sac.” So Dyson may have been a conservative but he was a very thoughtful conservative. Reading this book I got a real sense of the man. Spicer doesn’t overlook his faults and shortcomings but he paints a sympathetic portrait and I think he’s right to do so. I learned a great deal about Dyson as well as about his music from this study and came away from it with my admiration for both significantly increased. The book includes succinct but thorough discussions of each significant Dyson piece – and some more modest ones - and copious musical examples are provided. The design of the book is good, though in order to accommodate the substantial text plus the appendices within 450 pages the print font is on the small side, though perfectly clear. The 17 chapters are all quite lengthy but I like very much the way Spicer has broken each chapter into logical segments, which is handy if you don’t have time to read a full chapter at one go. The appendices, compiled by Ray Siese, are an invaluable mine of information. There’s a list of Dyson’s works; a list of the texts that he set; details of 35 performances of The Canterbury Pilgrims that Dyson conducted between 1935 and 1960; a select bibliography; and a discography. Sir George Dyson was an important figure in twentieth-century British musical life. As a composer he didn’t match the stature of the likes of Elgar, Vaughan Williams or Britten but he was still a fine composer whose works deserve better than the neglect into which they have fallen. As an administrator and educator he was insightful and had much foresight, not least in his tireless work to involve in the love and practice of music as many people as possible and from all walks of life. Sadly, his music is not widely heard in our concert halls these days but at least, as I pointed out in my recent survey of Dyson recordings, all of his important works are now represented on CD and in good performances. 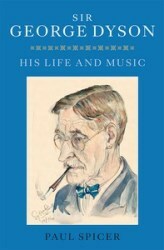 Paul Spicer has produced an excellent, comprehensive and very readable study of Sir George Dyson and his music. I learned a great deal from it and enjoyed it very much. I believe that Spicer is now working on a similar project devoted to Sir Arthur Bliss. When it appears that, surely, will be as welcome as his championship of Dyson in this important book.